Facilities have came to life from the dark conditions of past decades. Businesses are now becoming more energy efficient and are even looked down upon from their customers, suppliers and employees if they have not made the investment to become more energy efficient through upgrading to LED lighting. LED technology has made it possible for facilities to decrease their lighting load and increase their light quality. Energy efficiency is not the only reason to upgrade your facility to LED Lighting. Eyestrain, fatigue and headaches are a few health issues associated with old outdated facility lighting. The sharp illumination LED lighting provides can help improve employee health and even reduce accidents. Replacing old facility lighting with LED lighting can drastically reduce monthly electricity bills. Additionally, LED lighting products have a extremely long lifespan which equates to lower facility maintenance costs. 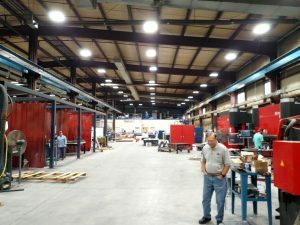 OGW Energy Resources located in Tipp City, Ohio specializes in facility LED lighting technologies. Our LED lighting staff will perform a lighting energy audit free of charge. During this lighting audit our staff will take the time to ask each department the appropriate lighting questions to make sure we deliver the right LED lighting solution. Our installation team has serviced the following states: Ohio, Michigan, Indiana, Illinois, Georgia, Kentucky, Kansas, Texas, Oklahoma, Pennsylvania and Missouri to mention a few. Give us a call at (937) 506-8133.